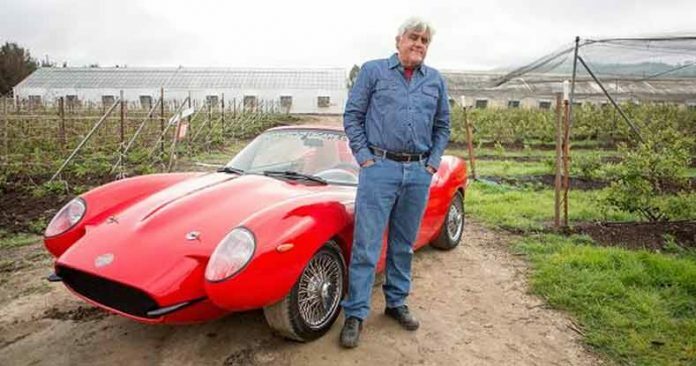 Jay Leno tested out a "Cannabis Car" made out of 100 pounds of non-psychoactive hemp plants. Future models could retail for around $40,000. On a recent episode of “Jay Leno’s Garage,” the retired comedian and late night show host showed off a luxury sports car that is made out of cannabis. Although many of the cars on the show are a part of Leno’s massive collection, this particular vehicle is actually owned by former Dell executive Bruce Dietzen. Dietzen spent $200,000 to build the prototype for this vehicle, in the hopes of creating a car that has a “carbon neutral” building process, meaning that no pollution is created during the manufacturing of the car. “No one said investing in the future is going to be cheap,” Dietzen said. It takes roughly 100 pounds of plant matter to build one of these cars. Luckily for us, now that the prototype is already built, the base model of the car will cost far less than that, but will still be fairly expensive, with a price tag of $40,000. This vehicle is a creation of “Renew Sports Cars,” Dietzen’s new company aimed at environmentally conscious cannabis based vehicles. According to Dietzen, manufacturing the average car creates roughly ten tons of carbon dioxide, and he wants to eliminate that waste by using cannabis. Making this car even more attractive, it is actually ten times stronger than steal, so it would not crumble in an accident as many people would assume. “Maybe we’ll hit a couple of cars and see what happens. Then we’ll really see how strong it is,” Leno joked. Leno also asked Dietzen if the choice of cannabis would create a public relations problem for his company. “It’s kind of a double edged sword. The marijuana connection garners the interest, but then people don’t take you seriously,” Leno said. However, Dietzen pointed out that not all strains of cannabis are psychoactive, and that he was using non-psychoactive hemp plants to build the cars. “You could smoke all the hemp you could want and you won’t get high,” Dietzen said. In an interview with the Miami Herald, Dietzen opened up about how he wanted to do something that made a difference after he retired from Dell. “I’m 61. I’m not going to go out there and get a bunch of people for financing who want to make quarterly numbers, because that’s a good way to sink a company. I’m doing it out of my belief in what needs to be done. I didn’t want to look at the end of my career and say, wow, I sold a bunch of computers,” he said. “Every bit of plastic in the world can be made from hemp instead of oil, and it needs to be. It’s one of the big ways we’re going to reverse climate change,” he added. He went on to explain that he was inspired by Henry Ford, the pioneering automaker who also made cars that ran on various plants. “It’s not that he cared about the environment, but because he was raised on a farm, he loved farmers, and the farmers back then were in as bad a shape as they are today,” Dietzen said of Ford. Ford was actually not the only early auto inventor who had a vision of cars running on plant based fuel. Rudolf Diesel, the inventor of the Diesel engine, built his original model to run on biofuel, but the engine was modified to run on gasoline after his untimely and mysterious death. As the Free Thought Project has reported, hemp production — if it were legalized nationally — could replace a number of products that pollute the environment. That fact that hemp is illegal at all is ridiculous as it cannot get you high and would only serve to further humanity’s quest for a more sustainable lifestyle.